Authors: Vincent Frano, Horticulture Major; Cian Gulsen, Horticulture Major; and Anna Ashe-Simmer, Natural Resource Conservation Major. In 1827, John J. Audubon published Birds of America, a 435 page book of full-color bird illustrations and accompanying field notes for each species (Audubon, n.d.). There are ten pages devoted to American woodpeckers, including one small, Midwestern native: the red-headed woodpecker (Melanerpes erythrocephalus) (Audubon, n.d.). In his observations, Audubon wrote, “It is impossible to form any estimate of the number of these birds seen in the United States during the summer months…” (Audubon, n.d.). He claims he observed someone shoot more than one-hundred red-headed woodpeckers from a cherry tree in a single day (Audubon, n.d.). Clearly, they were abundant. Though Audubon believed the bird to be common when he wrote his book, the red-headed woodpecker was already experiencing declines within its native range (Audubon, n.d.; Kaufman, n.d.). A variety of factors are responsible for the decline of this species, but loss of critical oak-savanna habitat has been particularly detrimental (Koenig, Walters, & Rodewald, 2017). The red-headed woodpecker is native to the Midwestern oak-savanna, a habitat type that consists of a grassland understory interspersed with large, old-growth oak trees (Santiago, 2004). The oak-savanna is important for this species for food resources (this species feeds on insects, invertebrates, berries, and acorns) and nesting habitat (they primarily nest in cavities in dead or decaying trees) (Dey & Kabrick, 2015; Kaufman, n.d.). Prior to European colonization, the oak-savanna covered an estimated 27-32 million acres across the Midwest, an area roughly the size of Mississippi (Santiago, 2004; IPL.org, n.d). But by 1985, only 6,442 acres of this critical habitat remained–0.02% of the original area (Santiago, 2004). The land was primarily cleared for lumber, farmland, and housing developments (Santiago, 2004). As urbanization has increased during the last century, the red-headed woodpeckers have simultaneously experienced more drastic population declines than ever before (Koenig, et. al., 2017). Once a common and abundant species, red-headed woodpecker populations have declined by 60% since the 1960’s (Anderson & LaMontagne, 2016). It is currently listed on both the 2015 State of the Birds Report’s Yellow Watch List and as ‘near threatened’ in the International Union for Conservation of Nature’s 2017 report (Koenig, et. al., 2017). Urban spaces are often void of adequate green space with dead or decaying trees for nesting or an abundance of oak trees as food supply, and are therefore unlikely to be inhabited by the red-headed woodpecker (Anderson & LaMontagne, 2016; Rodewald et al., 2005; Washington Department of Fish and Wildlife, 2011; Kaufman, n.d.). Large metropolitan cities can pose particular problems for the red-headed woodpecker due to high human population density and expansiveness (Santiago, 2004). Chicago, Illinois is the third largest metropolitan area in the United States and the largest within the range of the red-headed woodpecker, with a footprint of over 227 square miles (145,280 acres) (U.S. Census, 2010). During the mid-1800s, Chicago experienced dramatic urbanization (Dreyfus, 1995). Between 1850 and 1860 the city’s population tripled and continued to grow with the advent of railroads, which led to the rapid transformation of land into urban area (Dreyfus, 1995). While population growth has slowed in the last century, population density has increased. The human population density in Chicago has increased by more than 1.2% between 2010 and 2016 (Kolko, 2017). In comparison, New York’s density only rose by 0.5% in the same time (Kolko, 2017). As population density intensifies, so does housing development, and green space has become increasingly hard to find (Kolko, 2017). And while human development is expanding, only 8.5% of the land area in Chicago is designated public parks, compared to more than double this in New York City (Harnik & Donahue, 2012, p. 10). As urbanization expands, adequate habitat for the red-headed woodpecker has become increasingly limited. Red-headed woodpeckers are important to the urban environment due to their ability to create wildlife habitat for other species (Wenny, et. al., 2011). Woodpeckers forage and nest in snags, and as a result, create cavities in the tree that can be utilized by other species (Gentry & Vierling, 2008). In a study conducted in South Dakota, American kestrels, black-capped chickadees, nuthatches, bats, and Northern flying squirrels were found nesting in cavities created by red-headed woodpeckers. 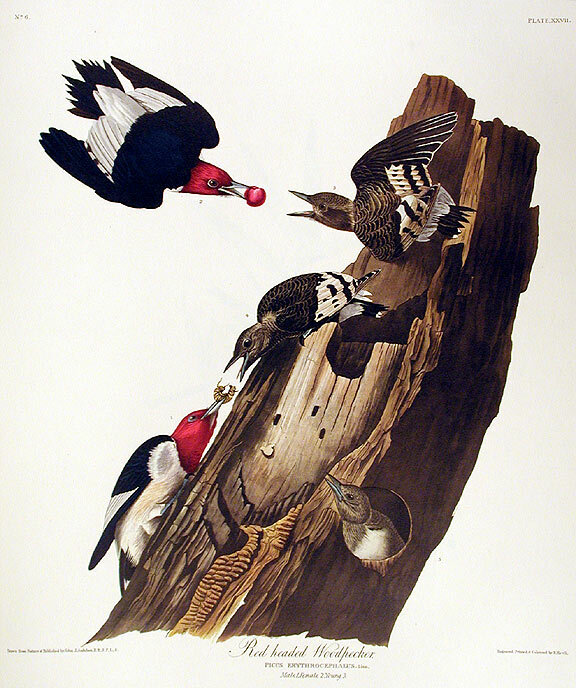 These species are all secondary cavity nesters, meaning that they rely on excavators like the red-headed woodpecker to create cavities in snags (Gentry & Vierling, 2008). In urban areas, where biodiversity tends to be low, this species can provide important habitat for a variety of species that would otherwise not exist in the urban landscape. Red-headed woodpeckers can have positive impacts on the local urban ecosystem by improving the health of the surrounding oak trees (Santiago, 2004). In Chicago, the native oak tree population has been in decline in recent decades (Nowak, et. al., 2013). Many of Chicago’s large, old oaks were planted before the city was urbanized, and are now reaching the end of their lifespans (Nowak, et al., 2013). They have had difficulty seeding due to the large expanses of impervious surfaces (i.e. roads and sidewalks) and lack of acorn dispersers (Nowak, et. al., 2013; Wenny, et. al., 2011). Studies have shown that avian acorn dispersers (like the red-headed woodpecker) are key species in urban parks with large oak stands (Wenny, et. al., 2011). In Stockholm, Sweden, Eurasian Jays (Garrulus glandarius) were found to be responsible for over 85% of acorn dispersal in an old-growth oak forest in an urban park (Hougner, Colding, Söderqvist, 2006, p. 370). The oaks in this landscape consequently support communities of nesting birds and bats, lichens, and insects (Hougner, et. al., 2006). Red-headed woodpeckers also feed on oak acorns in the Midwestern US, and, like the Eurasian Jay, create large stores of acorns to feed on during winter months when insects are sparse (Smith, 1986). Oaks in the Midwest rely on birds like woodpeckers to disperse their seeds, and woodpeckers benefit from the existence of oaks for winter food resources (Smith, 1986). In an urban landscape like Chicago, there are limited seed resources for woodpeckers and limited seed dispersers for oaks (Santiago, 2004). The mutualistic relationship between the two can be especially beneficial in an urban environment where biodiversity and resources are limited. Red-headed woodpeckers are also important in urban environments for pest control. In Chicago, for instance, there has been a significant rise in the emerald ash borer (Agrilus planipennis, abbv. EAB). EAB is an invasive beetle that devours the bark of ash trees, and is responsible for killing more than 54 million ash trees in Indiana, Michigan, and Ohio alone (Koenig & Liebhold, 2017). This poses a significant problem in Chicago–ash trees make up more than 17% of the city’s street trees, not including the more than 300,000 ash that exist on private lands (i.e. private golf courses) (City of Chicago Department of Streets and Sanitation, 2018). Breakouts of EAB are extremely costly due to the limited effectiveness of insecticides and the high cost of cutting down infected trees (Streets and Sanitation, 2018). However, studies have shown that woodpeckers significantly reduce EAB populations (Koenig & Liebhold, 2017). Red-headed woodpeckers feed heavily on EAB larvae during breakouts. During winter, when EAB larvae are most accessible to insectivorous birds, red-headed woodpecker population increased more than 48.5% (Koenig & Liebhold, 2017). In Chicago, improving habitat for red-headed woodpeckers has the potential to reduce future outbreaks of EAB in the city. Green spaces within urban environments are important for species like the red-headed woodpecker. Golf courses are a particularly useful as habitat due to their abundance and size (Santiago, 2004). They are continuing to increase in number, with an 18% increase between 1987 and 1996 (Tanner & Gange, 2004, p. 138). Within the Chicago metro area there are over 200 golf courses, six of which are part of the city’s 8,100 acre municipal park district (Golf Advisor, n.d.). An average 18-hole golf course sits on 133 acres, and up to 70% is considered to be out of play areas that hold the potential to support wildlife (Saarikivi, 2016, p. 9). This translates to a potential 558 acres of wildlife habitat available on golf courses within Chicago’s municipal parks alone. However, the design and maintenance of golf courses are important factors that determine whether they can support a red-headed woodpecker population (Koenig, et. al., 2017). Water use, chemical applications, water features and habitat modifications are all concerns that must be addressed in determining ecological benefits. A number of studies show that golf courses can benefit biodiversity under sustainable and ecologically-friendly management practices (Colding et al., 2009; Jim & Chen, 2016; Kohler et al., 2004; Mankin, 2000; Salgot & Tapias, 2006; Tanner & Gange, 2005; Yasuda & Koike, 2004). In urban settings, golf courses with forest cover can support a thriving red-headed woodpecker population by providing habitat that is scarce in the surrounding environment. Red-headed woodpeckers favor landscapes with forest cover, open understories, lower canopies, and proximity to open grassland (Anderson & LaMontagne, 2016; Rodewald et al., 2005). Given this, golf courses have the potential to support these birds by providing ideal habitat. Open areas, like fairways, allow the woodpeckers to forage for insects in flight (Anderson & LaMontagne, 2016). Additionally, waterways, such as constructed wetlands and fairway ponds, act as breeding sites for insects, the primary summer food of red-headed woodpeckers (Anderson & LaMontagne, 2016). Studies have shown that the red-headed woodpecker prefers nesting sites within close proximity to waterways, which may be related to insect abundance (Anderson & LaMontagne, 2016; Rodewald et al., 2005). This further suggests that golf courses, with their varied landscapes, can allow the species to thrive in urban environments. One concern is the effect that daily use of courses by golfers and frequent maintenance activities might have on nesting woodpeckers. However, nesting activity on golf courses seems more related to the presence of favorable nesting sites than levels of human activity ((Rodewald, Santiago, & Rodewald, 2005). Of 17 golf courses studied in Ohio, 49 active nest were recorded, suggesting the woodpeckers are not likely dissuaded by golf course activity (Rodewald, Santiago, & Rodewald, 2005, p. 451). Courses with resident red-headed woodpeckers had twice as many snags and trees with dead branches compared to courses that lacked woodpeckers (Rodewald, Santiago, & Rodewald, 2005, p. 451). Therefore the preservation of naturalistic forest areas that allow for some dead and decaying trees is most important when determining the viability of a golf course as suitable habitat. Golf courses seem promising as urban habitat for the red-headed woodpecker, although the ecological value of golf courses is hotly debated. Opponents assert that golf courses are ecologically barren and useless to wildlife (Saarikivi, 2016). The arguments against golf courses cite heavy chemical inputs of fertilizers and pesticides, combined with intensive management and resource use, as degrading any ecological value (Saarikivi, 2016). Indeed management styles are an important consideration that needs addressing in determining the ecological value of golf courses. Pesticide use is of particular concern in supporting red-headed woodpeckers since their primary food source is insects. Plants only take up about 5% of applied pesticides, meaning the rest ends up as runoff (Royte, 2017). When runoff reaches waterways, insect breeding grounds become contaminated, killing insect larva (Royte, 2017). This can impact bird populations by reducing available food sources provided by insects not considered pest of turf (Royte, 2017). Red-headed woodpeckers have been observed foraging for insects from turf areas, which could potentially expose them to insecticides used on golf courses (Rodewald, Santiago, & Rodewald, 2005). As little as a single corn seed coated in imidacloprid, a common pesticide also used for turf grass, is enough to kill birds the size of the red-headed woodpecker (Royte, 2017). Furthermore, imidacloprid has been shown to have toxic effects on sparrows, even at doses considered sublethal (Royte, 2017). Three days following exposure, the birds had lost 25% of their bodyweight (Royte, 2017). While sublethal doses may be larger for woodpeckers due to their difference in size from sparrows, this study shows that insecticides may have negative impacts on birds like red-headed woodpeckers. Improved chemical management plans that reduce pesticide and fertilizer inputs and emphasising naturalistic landscape designs allow golf courses to become thriving ecosystems capable of supporting a diversity of life (Mankin, 2000; Saarikivi, 2016). Even with ecological management, one may argue that golf courses do not provide suitable habitat for birds like the red-headed woodpecker due to their specific habitat requirements. Generally the snags are removed for safety reasons, as rotting and dead trees or branches can fall and pose a hazard (Washington Department of Fish and Wildlife, 2011). Golf courses may also remove older or damaged trees due to management concerns. Large, older trees near tees and greens can compete with turf grass for water and produce extensive root systems that may disrupt greens (Lucas, n.d.). Damaged trees can take up canopy space, thus reducing sunlight available to nearby trees, which can reduce the growth of younger, healthier trees (Lucas, n.d.). These are legitimate concerns for golf course managers who wish to maintain the health and playability of turf areas. However, both older trees and damaged trees offer potential habitat to woodpeckers and other species (Gentry & Vierling, 2008; Washington Department of Fish and Wildlife, 2011). Dead limbs can provide nesting habitat; fungus infected trees provide both food and habitat; and old trees have the potential to become large snags capable of supporting diverse animal communities (Anderson & LaMontagne, 2016; Gentry & Vierling, 2008; Washington Department of Fish and Wildlife, 2011). Adequate habitat can be maintained through careful design and management practices that allow for the preservation of snags without having to compromise golf course safety and turf grass health. Snags and decaying trees can be kept in the interior of wooded areas so that golfer safety is not compromised (Purcell, 2007). Midwestern savanna are dominated by oak species and by increasing tree density, these habitats promote species diversity in the understory vegetation (Dey & Kabrick, 2015). Woodland edges with a selection of shrubs can act as a screen for untidy natural woodland interiors and help improve golf course aesthetics (Purcell, 2007). Integral design features, like forested areas and constructed wetlands, can create a favorable ecosystem to help support red-headed woodpecker diversity. (Love, 2008). A typical 18-hole golf course has an average of 93 acres that are considered to be rough areas of the hole or out of play (Saarikivi, 2016, p. 9). These areas are unused by golfers, and have the potential to provide habitat for a variety of birds including the red-headed woodpecker (Saarikivi, 2016). Species like the eastern bluebird, tree swallow, purple martin, red-cockaded woodpecker, and osprey can utilize these rough areas as habitat if it is improved for wildlife (Saarikivi, 2016; Rodewald et al., 2005; Washington Department of Fish and Wildlife, 2011). Naturally existing trees are an integral component of golf courses that provide specific areas of vegetation required for connectivity of adjacent wildlife (Love, 2008). While populations of the red-headed woodpecker have plummeted due to urbanization, the species thrives in the habitats of golf courses due to the sheltering canopy of large trees in the area (Saarikivi, 2016). In a study focused on the red-headed woodpecker population in Cook County, IL (a county that includes the city of Chicago), researchers found that only 7 of the 34 nesting trees were located in city parks while the remaining 27 appeared in forested areas of the city (Anderson & LaMontagne, 2015, p. 305). This suggests that the woodpecker needs large, uninterrupted areas of green space as opposed to isolated parks (Anderson & LaMontagne, 2015). A golf course is a large enough green space to act as habitat for the woodpecker if the area of forest cover is increased (Saarikivi, 2016). To effectively promote the red-headed woodpecker population in Chicago, golf course managers should convert rough areas and out-of play areas to mimic the oak-savanna ecosystem. Woodpeckers need low tree density, with low to moderate canopy cover, and sufficient abundance of insects, acorns, and visible fungus on trees (food source) in order to nest in the area (Kaufman, n.d.; Anderson & LaMontagne, 2015). Mid-western oak-savannas are dominated by oak species, but tree reproduction is patchy, resulting in a spacious layout of trees (Dey & Kabrick, 2015). The uneven distribution of the tree canopies in savannas and low density creates a range of canopy cover from full to open space (Dey & Kabrick, 2015). A complete management system must be instituted in order to promote an artificial oak-savanna habitat on golf courses. Introducing long-lasting oak species like the Post Oak (that lives over 400 years), can distribute a number of seeds for regeneration, and then be removed before it dominates the landscape (Dey & Kabrick, 418). Highly monitored prescribed burning or chemical applications, as well as tree removal, can aid in the decrease of tree density when it becomes too high (Dey & Kabrick, 2015). Over time, the habitat will thrive with a varying age-range of its tree species which can sustain the ideal tree density required by the red-headed woodpecker (Dey & Kabrick, 2015; Anderson & LaMontagne, 2015). Restoration of these oak-dominated ecosystems on golf courses would promote the population of red-headed woodpeckers, which would then promote acorn dispersal of oaks in the area, and the health of both oaks and red-headed woodpeckers would be vastly improved (Dey & Kabrick, 2015; Wenny et. al., 2011). By creating an artificial oak-savanna habitat on golf courses within the city of Chicago, critical habitat area for the red-headed woodpecker can expand, leading to potential increases in its population (Dey & Kabrick, 2015; Santiago, 2004). Proper water quality is one of the most vital components for maintaining suitable woodpecker habitat, and specific design features can improve this (Love, 2008). Constructed wetlands and water features are important design components that ensure uncontaminated water. Clean water promotes tree and vegetation development, which in turn allows for a clean environment and drinking water for the woodpeckers. Constructed wetlands can potentially remove between 95% and 100% of nitrogen and up to 74% of phosphorus resulting from fertilizer applications (Kohler et al., 2004, p. 291- 294). Without proper water quality, the tree density and fungal requirements favored by red-headed woodpeckers wouldn’t be as readily available because the habitat itself wouldn’t grow. Wetlands are habitat for many protected wildlife and plants and can be implemented on golf courses (Love, 2008). Constructed wetlands can positively affect surrounding waterways by acting as a filtration system, reducing contaminants in runoff from golf courses and surrounding urban areas (Kohler, Poole, Reicher, & Turco, 2004). Sand caps, bioswales (sloped mounds on the course), wet cells (low areas that collect water), and tall grass buffers also help to reduce surface runoff (Miltner, 2007). Sand caps are a set depth of sand underneath the course that allow for infiltration and stormwater storage and bioswales, wet cells, and tall grass buffers are strategically placed on the course to trap water in the turfgrass where it is filtered out by microorganisms and plant roots (Miltner, 2007). Tall grass buffers located on the edge of bodies of water intercept polluted runoff between the golf course and the body of water and can significantly reduce nutrient and sediment runoff (Mackay, 2001). A buffer is maintained with plants that reduce stormwater flow and pollution runoff (Mackay, 2001). Water features provide aesthetic appeal as well as improve erosion control and stormwater management which aids in the quality of the watershed of the area (Love, 2008). If properly designed to coordinate with pre-existing drainage patterns, constructed wetlands can help reduce fertilizer and pesticide runoff (Love, 2008). Grass cover also helps to reduce runoff; when turf is properly managed to maintain ample coverage, runoff can be reduced by 8mm per year compared to unmanaged conditions (Mankin, 2000, p. 265). This is because the turf forms a tightly compact system of roots and a grass canopy that make it very difficult for surface runoff to “run”and leach into soil or waterways (Mugaas, Agnew, Christians, 2005). Sustainable management practices benefit biodiversity by preserving a thriving ecosystem that can also improve water quality, making golf courses a potential safe-haven for the declining woodpecker population. However, not all golf course owners are willing to voluntarily make changes to their courses for the sake of threatened species like the red-headed woodpecker (Looney, 2017; Rubin, 2017). Conservation easements offer a promising framework to incentivise land conservation and encourage golf course owners to adopt these sustainable management practices (Rubin, 2017). In 1976, Congress passed the Tax Reform Act, which included a conservation easement program to incentivize landowners to donate their land to conservation organizations (Parker, 2005). In return, landowners receive a tax deduction equal to market value of the land that is donated (Looney, 2017). Landowners agree to permanent development restrictions on their land, and all development rights are donated to a land trust (Rubin, 2017). Essentially, this ensures that the land is protected from any further development (even if the land is later sold or divided), but the landowner still has the rights to continue managing it for certain government-approved uses (Parker, 2005). These uses are intended to be of low impact to the environment, such as for historical importance, agricultural use, wildlife habitat, and/or outdoor recreation (Parker, 2005). Golf courses, being primarily used for outdoor recreation and having the potential to provide wildlife habitat, are therefore eligible for this conservation easement program (Parker, 2005). Golf courses that are protected under conservation easement programs can never be converted to housing developments, which is especially important in urban spaces like Chicago, where green space is scarce (Rubin, 2017; Harnik & Donahue, 2012). The conservation easement program has been effective at promoting wildlife habitat on some golf courses. The Merit Club is an example of a golf course that has successfully converted out-of-play areas into wildlife habitat after enrolling in the conservation easement program (Taggart & Roe, 2010). Located in the Chicago suburbs, the golf course is part of a network of protected lands that are home to 14 endangered species (Taggart & Roe, 2010, p. 393). The 318 acre property includes 165 acres of restored tall-grass prairie, wetlands, and oak-savanna. This land provides valuable habitat for native species (Taggart & Roe, 2010, p. 393). The Eagle Ridge Golf Club in Ocean County, New Jersey is another example of conservation easement success. The coastal golf club maintains native grasslands, riparian habitats, and wetlands that are home to 58 species of birds and numerous other wildlife (NJ Audubon Society, 2014, p.13) . In addition to offering a pristine environment for playing golf, the golf club provides opportunities to educate the public on land stewardship and conservation. In this way they encourage members of the community to implement habitat improvements on their properties, thus creating interconnected habitat (NJ Audubon Society, 2014). Both golf clubs are a testament to conservation easement programs at work. While regular monitoring and maintenance are required to ensure natural areas remain intact, money gained from the conservation easement program is intended to support the enhancement of natural areas (Rubin, 2017). However, conservation easements have been misused in recent times, especially when concerning golf courses (Rubin, 2017). Kiva Dunes is a 368 acre golf course located along the coast of Alabama. Shortly after constructing the course in 1992, the property owner donated the land as a part of a conservation easement and consequently received a $29 million tax deduction (Deal, 2013, p. 1590; Looney, 2017, p. 19). President Donald Trump received a $39.1 million tax deduction in 2005 for a conservation easement on one of his New Jersey golf courses (Rattner, 2016). These easements were incredibly lucrative for landowners, yet their benefits towards conservation are debatable (Looney, 2017). Currently the IRS is the primary organization providing oversight of conservation easements (Moorhead, 2016). They have contested and brought to court questionable tax deductions, such as the one claimed by Kiva Dunes (Moorhead, 2016). However, the IRS is not well equipped to monitor conservation easements regularly and they are not always successful in contesting golf course tax deductions (Moorhead, 2016). Critics of the easement program have argued that golf courses should be excluded from tax deduction incentive altogether due to their costliness and ineffectiveness (Rattner, 2016). However, in urban spaces, golf courses have incredible potential to act as wildlife habitat (Saarikivi, 2016). By creating clearer standards and specific management requirements, conservation easement programs can effectively promote habitat for the red-headed woodpecker on golf courses in Chicago. Organizations like Audubon International are already working with some golf course owners on a voluntary basis to improve the quality of wildlife habitat (Audubon International, n.d.). Currently the non-profit organization works with golf courses to become a Certified Audubon Cooperative Sanctuary (Audubon International, n.d.). There are already 8 golf courses within Chicago that are active members of this program (Audubon International, n.d.). Interested golf courses must undergo stringent habitat, water management, and pest management practice reviews in order to be approved (Audubon International, n.d.). Every three years a review process is required in order to maintain membership (Audubon International, n.d.). Those that do not meet their criteria are rejected from the program (Audubon International, n.d.). For those that do not yet meet the necessary criteria, Audubon International consults with golf course owners to develop an ecological management and land stewardship plan (Audubon International, n.d.). A similar model could be used by the federal government to create a Conservation Easement Oversight Commission (CEOC) that could oversee and approve all land donations by golf courses, ensuring that donated land is maintained for conservation purposes (State Auditor of Colorado, 2012). As part of this, the CEOC must keep detailed records of conservation easement holders that includes annual reviews of donated land. Like the Audubon International program, golf courses under conservation easements would be required to uphold certain standards. In addition to the CEOC, the Fish and Wildlife Service would partner with golf courses to ensure that donated land is properly maintained. Golf courses would be obligated to develop an environmental plan that is required to include wildlife and habitat management, water conservation, chemical use reduction and safety, and water quality management (Audubon International, n.d.). Each golf course would have a management plan that focuses on species or community of concern in the area (i.e. red headed woodpecker on Chicago golf courses), and management techniques would be tailored to meet their habitat requirements (Audubon International, n.d.). Through these additional oversight measures and well defined requirements, golf course conservation easements can become effective in incentivising golf courses to create wildlife habitat. Some may argue that improving habitat on the course will be costly due to the costs of hiring maintenance staff and landscape designers. However, the long term costs of maintaining open woodland habitat instead of turfgrass can reduce overall costs (Audubon International, n.d.; Kiss, 1998; Purcell, 2007). Reduced chemical inputs, such as fertilizers and pesticides, will reduce overhead costs (Kiss, 1998). Additionally, taking a hands off approach to out of play areas will allow for naturalistic environments, and can reduce costs associated with tree and landscape maintenance (Kiss, 1998). Golf courses are a large economical resource that have the ability to make significant environmental impacts just by purposefully designing and managing for biodiversity and ecological improvements (Saarikivi, 2016). Furthermore, tax incentive dollars can be utilized to cover the initial costs associated with design and maintenance improvements. The red-headed woodpecker plays an important role in ecosystem dynamics in the Midwest, and has the potential to benefit the city of Chicago if golf course habitat is improved (Anderson & LaMontagne, 2015). Woodpeckers are important for pest control within cities and can positively impact local biodiversity through seed dispersal, (Koenig & Liebhold, 2017). However, as urbanization expands in the Midwest, critical oak-savanna habitat is becoming increasingly limited, leading to significant declines of red-headed woodpecker populations in the past decades (Blewett & Marzluff, 2005; Kight, et. al., 2012). Expanding woodland on a golf course that mimics oak-savanna habitat can create habitat for this woodpecker, and consequently create habitat for other species of birds, mammals, and insects (Dey & Kabrick, 2015). However, an incentive program is needed to promote sustainable golf course management techniques (Looney, 2017). Conservation easements are promising options to incentivise land stewardship, but currently lack sufficient oversight (Gilligan, 2018; NJ Audubon Society, 2014; Taggart & Roe, 2010; Looney, 2017). With stricter standards and specific management requirements, conservation easement programs can effectively promote habitat for the red-headed woodpecker on golf courses in Chicago. Implementation of this revised program on a nationwide scale could create important areas of refuge for other wildlife besides the red-headed woodpecker, and contribute to habitat restoration across the country Washington Department of Fish and Wildlife, 2011; Saarikivi, 2016; Santiago, 2004). Gilligan, G. (2018). Most of River’s Bend golf course put under conservation easement. Hougner C, Colding J, Söderqvist T. 2006. Economic valuation of a seed dispersal service in the Stockholm National Urban Park, Sweden. Ecological Economics, 59, 364–374. https://doi.org/10.1016/j.ecolecon.2005.11.007. Mankin, K. R. (2000). An integrated approach for modelling and managing golf course water quality and ecosystem diversity. Ecological Modelling, 133(3), 259-267. Retrieved from Science Direct. NJ Audubon Society. (2014). NJ Audubon Corporate Stewardship Annual Meeting. NJDEP. Retrieved from www.njaudubon.org. Salgot, M., & Tapias, J. C. (2006). Golf courses: Environmental impacts. Tourism and Hospitality Research, 6(3), 218-226. Retrieved from Sage Journals. This is really awesome information! Who would’ve guessed it.